Even though it felt like a single heartbeat, I was surprised to learn that only two hours had passed since the time we checked into Luce's Lodge. It could have been much longer. While Beat was choking down his spaghetti and trying to recover his energy, I spent most of an hour in the back room with all of my gear spread out in front of me. Finally, I decided to put most all of it on — microfleece tights, wind tights and wind shell pants, fresh polypro base layer, microfleece pullover, wind vest, Gore-tex shell, thin balaclava, face mask, windstopper hat and fleece balaclava, gators, liner mittens, shell gloves with handwarmers, vapor barrier socks with feet warmers and Drymax liner socks. The only items of clothing I packed back into my sled were things I had more than one of, such as liner gloves and socks, and my down coat — my lifeline. I started the race feeling over-packed and it only took me 40 miles to make use of nearly every non-required item I brought. It was just after midnight when we stepped back out into the deep cold, but as Danni predicted, the wind had died down. I briefly glanced at the thermometer on the river and saw the needle hovering near minus 20. I didn't need to look any closer. "It will probably take us five hours to get to Alexander Lake," Beat said, and I agreed. We started trudging up the Yentna River. The trailed veered back into the woods, climbing the river bluff and emerging into yet more rolling swamps. The glittering sky became more muted, an indication that it was starting to cloud up. Having moved several dozens of miles inland, the robust birch and hemlock we passed when we started the race were gone. The forest had deteriorated into stands of scraggly black spruce that twisted in gothic shapes over frozen swamps — the kind of scenery that dominates Alaska's Interior. It was strange to think that it was possible to cross entire climate zones on foot, and the time it was taking made it seem more like an expedition than a 100-mile race. "This is one way to get your money's worth out of the Su100. Walk it," I thought to myself. "I feel bad for those biker guys who have to sleep in their own beds tonight. They're completely missing out." It was a lie, of course, but it felt good to think it. We passed Danni about seven or eight miles from the checkpoint. "How are you feeling?" I asked her. "I feel cold," was all she said. I lingered for a second, expected to start exchanging our usual playful banter, but then realized the expectation was ridiculous. We weren't out for a fun hike in Glacier National Park. 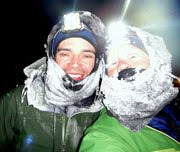 We had just walked 50 miles through the middle of nowhere Alaska and it was minus 20 out. It was a time for solitude and silence. Even Beat and I didn't say much in the 12 miles to Alexander Lake, except to remark about the soft trail, its difficult footing, and how slow-going it was. We were only five miles from the checkpoint when we encountered the first skiers — a mere 10 miles in front of us. Their proximity to a couple of mid-to-back-pack runners spoke to just how bad the trail really was. From the inside of my ice-crusted face mask, I could hear my raspy breaths becoming louder and more frequent. I was working so hard. I was tired. And yet I was moving so slowly. It just wasn't fair. At 4:30 a.m., we practically crawled up the steep hillside toward the Alexander Lake cabin. The tiny single-room building was choked with bodies, some sprawled out on a bunk bed and benches, others slumped against tables and the floor. It looked like a makeshift morgue for the victims of some kind of mountaineering tragedy. The other two people on the "Couple's Foot Tour of the Susitna 100," David Johnston and Andrea Hambach, were two of only a few who were still awake inside the stuffy, crowded room. "It's easier running 50 miles than trying to hang out here," David said, and I could relate to the stifling claustrophobia of an overly crowded checkpoint. The checker got cups of soup for Beat and I as Beat put on dry layers. He said he overdressed for the trip in. I told him I had put on nearly everything I brought, and still sweat so little that my base layer was essentially dry. I nervously hoped it didn't get much colder. About 30 minutes later, Danni stumbled in. She was shivering and looked extremely tired. "I need a nap," she said, then spread out her sleeping bag and crawled under the checker's table. The checker expressed irritation but Danni was already zonked out. I felt bad for the checker, being stuck in this stifling place all night long. I wasn't about to stay much longer. I figured most of the people there were dropping out of the race, probably in various states of moaning pain, and it was not a happy place to be. David and Andrea escaped and we left at 5:15. On the way out, I remembered to grab my poles out of my sled. I bought hiking poles last-minute at REI upon recommendation from my friend Amy Sebby, who ran the Susitna 100 last year and was biking it with her husband this year. Until Alexander Lake, at mile 53, I had forgotten about them, but pulling them out proved to be one of the smarter decisions I made. The poles helped me navigate the difficult footing in the punchy snow, and later in the race would save some pressure from my howling IT band. Plus, hiking with poles gave me a sense of purpose. Less trudging, more "skiing." I felt smooth and efficient as I "glided" along the winding trail. That sense of purpose soon faded into overwhelming exhaustion. I started stumbling often, and more than once drifted all the way off the trail into the deep snow, where I had to use my poles to push myself out. I had taken two caffeine pills at Alexander Lake, but they seemed to be doing nothing. "I'm falling asleep on my feet," I said to Beat the next time I caught up with him. "Seriously, I don't think I'm going to get through this thing without a nap." "You'll be fine," Beat said. "Just wait for the sunrise. You'll see." "No, seriously, I am too tired," I said. "I can't even keep my eyes open." "You're not going to fall asleep," he said. "Just keep moving. When the sun comes up, you'll feel better." Dawn was breaking with an eerie, deep crimson light on the horizon. The red glow and violet sky made the black spruce forest seem even more foreboding, and the swamps never seemed to end. I pulled out my secret weapon, chocolate covered espresso beans, and started stuffing them in my mouth with abandon. Before I knew it, the entire bag was nearly gone. The caffeine and sugar did revive me some, and the growing light muted my overwhelming desire to sleep. I was glad to leave the gothic swamps and drop back onto the wide Yentna River. In my four times traveling on that river, I hadn't once been there during daylight hours. I was excited to see it from this new point of view. We stopped at Luce's again, now 65 miles into the race. It felt like success, but there was still a long, long way to go. Beat encouraged more eating so I ordered a grilled cheese sandwich and more coffee. We congratulated a cyclist, Anna, who managed to revive herself from the dead at Alexander Lake and continue down the trail. "I admire that kind of fortitude more than I admire speed," I told her. Perhaps this is because I can relate to fortitude, but still — it takes some serious grit to not give up after you've convinced yourself you have to give up. We finally broke away from Luce's Lodge at 10:45 a.m., and walked into what felt like a balmy morning. In the new heat, I could actually pull my face mask down and breathe fresh air, and take my mittens off for more than a second to eat and take photos. "Wow, I can't believe how much it's warmed up," I remarked to Beat as we packed up. Then I looked over at the thermometer. It was 0 degrees outside, but in comparison to the night, it felt like spring. The proprietors at Luce's had warned us that the Iron Dog Snowmachine Race was to begin at 11 a.m. Known as the world's longest and toughest snowmobile race, the Iron Dog takes participants nearly 2,000 miles, across the Alaska backcountry to Nome and back to Fairbanks. I'm normally a fan of the Iron Dog — really, anybody who dares to traverse such incredible and hostile country on the Iditarod Trail is pretty awesome in my book. But I was not looking forward to watching snowmobiles race toward us at 90 mph. Sure enough, the first pair zipped past us about two miles from Luce's, and more followed in short order. Motors hummed like manic mosquitoes and processions of bush planes buzzed overhead. Spectators lined the river with their snowmobiles, building fires on the ice, drinking beers, and sometimes yelling toward us. One team headed straight toward Beat and me before veering around us, one snowmobile on each side of us helpless hikers. Others buzzed closely beside us while launching off nearby jumbles of ice that had been smoothed over to resemble a motocross course. We were both uneasy and I was borderline terrified, but I didn't know where else to go. The trail itself was nearly as wide as the river, and it was impossible to determine where exactly the fast-approaching snowmobiles would choose to pass. All we could do was stick close to the Su100 stakes and hope the Iron Dog snowmobilers made a conscious choice not to run us over. I quickly grew tired of the Iron Dog circus, and wanted nothing more but to get off that frantic river. Shortly after I made a choice to increase my effort as much as I could physically stand, I started to feel quite ill. I felt flashes of extreme heat followed by almost instantaneous deep chills, until I had to stop and lean against my poles, breathing hard and waiting for the vomit that would not come. Amid my nausea is when I also first started to notice just how much pain my feet and legs were in. My IT band burned and my feet throbbed with every step. I blinked against the hard sun but there was nothing but sickness, and pain, and more sickness. Beat tried to talk me through it; he offered ginger candies and encouraged me to eat, but I knew eating was an unthinkable proposition, like pouring hot acid on a fire. Sometimes I felt so overheated that it was all I could do not to rip all of my layers off, but the chill would come so quickly that I refrained. "My feet are killing me. My legs are killing me. My body's shutting down." I breathed heavily in and out, in and out, but the only relief was my brief stops to lean against my poles. "You're just sick," Beat told me. "It happens during an ultra. Just keep moving. You'll get through it." Snowmobiles raced by. I started to secretly fantasize about one of them smacking me head-on and putting me quickly out of my misery. I was beyond the ability to put words together into a coherent sentence. So when Beat looked at his phone GPS and warned me that we might have to pick up the pace in order to make the cutoff, I just grunted, "Can't." "We're not even doing 2 mph right now," he said. "If you can just try for 2.5 ..."
"This is just ... way ... more hurty than I thought," I said. "I know," he said. "It hurts. But it won't always hurt this bad. Just keep moving." "I can't do this for 30 more miles," I said. "I just can't." "What are you going to do?" he asked. "You can't just sit down on the trail and wait." "I know that," I said, still breathing heavily. "I know that. But Flathorn Lake. I just have to make it to Flathorn Lake." "Oh, there's not going to be any more 100-mile runs," I said. "I hope I don't finish Susitna cause I don't want to qualify for Tahoe." "No more 100-mile runs?" Beat said, sounding genuinely disappointed. "No," I said, not even hiding the irritation in my voice. "Please, please. I can't think about that. I can't think about the cut-off. It just stresses me out. It makes me feel worse. Please can I just drag along for a bit and try not to think about how awful I feel?" Beat seemed dejected that I was being so unfairly grumpy with him, but nodded and walked on ahead. I fished out my iPod shuffle. Instead of listening the music, though, I could only think of it in terms of time. "One song is about five minutes; that's 12 songs an hour. At 2 mph that's 12 songs for two miles. Twelve miles to Flathorn means 72 songs. I can listen to 70 or so songs. Maybe add 10 more songs for the short ones, and because I'm moving slower than 2 mph." Then I started to count the songs. I made it to three songs, and lost count. The music droned on. We turned onto the Susitna River and the white expanse opened up even wider. My stomach started to settle a bit and I was able to force down some Goldfish crackers and a peanut butter cup, but I could not stop dwelling on the pain in my feet and legs. Every step felt like a prick of thousands of small and large needles. Even my song math couldn't hide the fact that I had lots and lots of hours left of this. It was ridiculous, so ridiculous, and unfair, even if I had done it to myself. My body didn't want to do this anymore, but it had to because I was the one who had stranded it out here in the middle of this god-foresaken Alaska river. My body was angry with me. I was angry with me. The music droned on. As I trudged toward the looming mass of Mount Susitna, my iPod switched over to a song from the "Ride the Divide" soundtrack. I downloaded this soundtrack, along with several other new albums, just days before the race so I'd have a fresh Susitna playlist. I downloaded the "Ride the Divide" music because I had seen the movie several times, and was hoping the music would fill my head with images from "Ride the Divide," which in turn would remind me of my better days during the 2009 Tour Divide. This particular song didn't ignite any recognition from the movie, but it did wrestle my attention away from my own self-absorbed suffer-fest. "July" by Amy Petty started to fill my soul with something that almost felt like hope. Do you remember when all we had to do was get up to go to school on time? Do you remember what it meant to refuse, said she wouldn’t let you play outside? Now before I lose myself in the blur, I go back where I begin. Tears filled my eyes, which quickly became streams, and before I even realized it, I was bawling. I was glad Beat was a ways ahead, because I was in the midst of a full-on emotional breakdown, blubbering, sobbing and generally just spewing out a lot of built-up pain and frustration. I wiped away the tears and snot and let more stream out. I reflected back to the 2006 Susitna 100 and my emotional breakdown in the Dismal Swamp, when it was raining and I was wet and cold and pushing my bike through the slush of that wide-open nothingness. There was a point when I sat down on the trail and gave up. And then I got up and kept going. I never forgot that moment, and can never forget that moment. It was the first time in my life I realized I could be that strong. And here I was, back on the Susitna River, back where I began. The black despair that had dominated my heart suddenly faded into something almost joyful. The pain was still there, but it was nothing I couldn't manage. "Beat's been through so much worse, and got through it," I told myself. "I've been through so much worse, and I got through it." I lifted my chin, plunged my poles into the squeaky snow, and attempted to march the best I could. The afternoon sun blazed overhead, already sinking lower on the horizon. I crawled up the icy Wall of Death and found Beat at the top. He had laid out his sleeping pad and gathered up some chocolate for a snack. He expected me to arrive broken, and was ready to make a peace offering. "Thank you so much," I said as I briefly sat on the mat. "But really, I'm so much better now. I was just at a low point. I just had to get through it. I'm sorry I was so grumpy with you." He wrapped his arms around me. "It's all right," he said. "It happens. I know how it is." Tears filled my eyes again. I was still an exhausted, over-emotional wreck, but at least now my overexagerated emotions were veering toward the positive. I was again overcome with love and gratitude. "Thanks so much for waiting for me," I said. "You know you didn't have to." "Of course," Beat said. "I wouldn't leave you." P.S. Beat has started posting his write-up from the race. You can read the first part here. I'm loving this! Getting to the point now where it's a delicious sort of pain to re-live. Really can't even fathom what it would have been like not to have wheels. Wunderbar! Reading your report is like to have been with you for a short moment - awesome! Wow, how amazing! Can't wait to read the next chapter. congrats on overcoming such lows. Your retelling of the race is so gripping and real. I truly feel what you were feeling through your words. The hope you continue to find when things seem hopeless is inspiring. Beat is a pretty wonderful guy, too. He seems to treat you with patient understanding and love. Awesome. Thank you very much for letting us experience your journey. You write so beautifully. I followed your spot report while looking at the map and was totally amazed that humans actually volunteer for such a trail. I am eagerly awaiting your Tour divide book. You and Beat are my role models for overcoming the extreme lows of life. No wonder your legs were giving you trouble - it's so damn flat! Rolling terrain is easier to cover since each stride is a little different, using different muscles/tendons. Running/walking 100 flat miles, with each step a lot like the last, is really tough. I think we cried in roughly the same spot though at different times of day. Pretty funny. I call that "The River of Tears"
Joe, it didn't feel like 100 miles of flat. Even though my GPS measured only about 3,500 feet of climbing over the entire course, it really felt more like 100 miles of uphill, even in the beginning when I was fresh. I actually experienced very little muscle pain; most of my pain was in different tendons in my feet and legs. My theory was that every step was too different, because the soft snow changes the surface with every step, requiring the feet and muscles to conform to the shape, and also to work pretty hard to propel off essentially bottomless "sand." All of my 50Ks were on hilly courses with 6,000-8,000 feet of climbing in 31 miles, and the first 22 miles of Susitna, which overall lost elevation, was still more strenuous than those races. Beat had a friend who told us Susitna was "so easy" because it's "flat," and we were cursing him by halfway through the race. Dang it...there must be something wrong with my eyes...sitting here trying to read your post and I'm all weepy for some reason. Must be this cold I'm fighting...yeah...that's it...a cold. Makes my eyes water. Jill...having never met you, I can still say that you have many gifts...one is quite obviously being mentally (and physically) tougher than anybody I know...another is being able to so eloquently express things in writing...I can't WAIT for your GDR book (I have a signed copy of "Ghost Trails" proudly on my shelf). Beat is a lucky guy (and also tougher than anybody I know). ""Of course," Beat said. "I wouldn't leave you."" Are you thinking what I'm thinking? I'm thinking "Donner Party." Maybe he wouldn't leave you because YOU WERE THE LAST DITCH FOOD SOURCE!" This chapter was an amazing story of going way deep in the pain cave and finding your way out. Great job and congratulations to both of you!